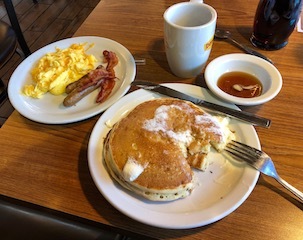 The Adventures of Tioga and George: Get Yourself To Denny's! I had begun to assemble the first of the remaining four drawers. When I went to fire a brad nail, it would not fire out of the Ryobi! The battery was not charged! My backup battery needed charging too! There I was waiting for a battery! It was cold [52 ℉]. "George! Get yourself to Denny's!" 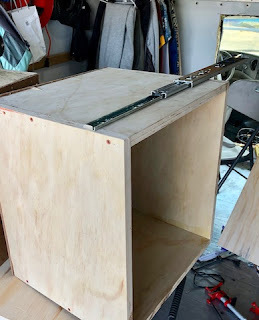 Now that I am getting pretty close to completing the first workshop cabinet, my thoughts have been turning to my living quarters [LQ]. LQ is going to have a raised floor to provide space for installing R-Tech 1" thick insulation [Link]. The floor is getting vinyl floor covering. The kitchen counter extends from the front to the rear wall [96"] and will contain a two-burner stove-top and stainless sink. In the cabinet under the kitchen counter will be the Nova Kool R5810 12-volt electric refrigerator [Link]. The exit wall to my workshop will have an oven and microwave. All the drawers are assembled. Now I begin installation of the roller bearing slides. Formula 409. This drawer was supposed to be only 12" high. Somehow, it's turned into a 14" high drawer!